The subject of this post is a Grade II Listed building within a rectangular block on the southwest corner of The Green, in Richmond, Surrey. The Green is described as one of the most beautiful urban greens surviving in England, and is an open green space overlooked by townhouses dating from the seventeenth to nineteenth centuries. One of the earliest buildings on the Green is a bicycle-maker’s shop at the corner of Duke Street, which contains sixteenth century wooden panelling, and is also described as containing a large Elizabethan fireplace. ‘Queen Anne’ House (No 11 The Green) dates from the early eighteenth century, with ironwork at the front and a pierced oak screen in the front hall predating the house. In the basement is a lead cistern dated 1715, and similar contemporary cisterns survive at Abbotsdene on the Green, and in Palace Place. 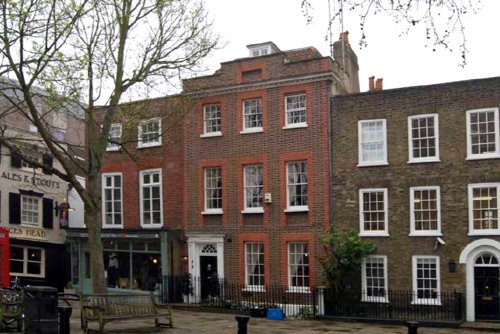 Of particular note on The Green is Maids of Honour Row, a terrace of houses built during the reign of George I to serve as lodgings for the Maids of Honour attending the Princess of Wales. The front elevation, which faces onto the Green has three bays, and is of three storeys with a basement and a dormer in the roof. The chimneystack rises on the right: that to the left belongs to the adjacent property. 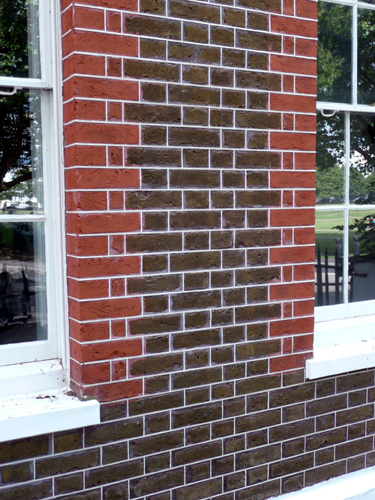 The principal building material is brown brick laid in Flemish bond with red brick dressings on the sash window reveals and quoins, and stone window sills and a stone doorcase. The façade has been recently tuckpointed. The roof is a flattened tiled mansard behind a parapet with a raised central section above a cornice with dentil brackets. The doorcase and front door are modern additions in the Georgian style. 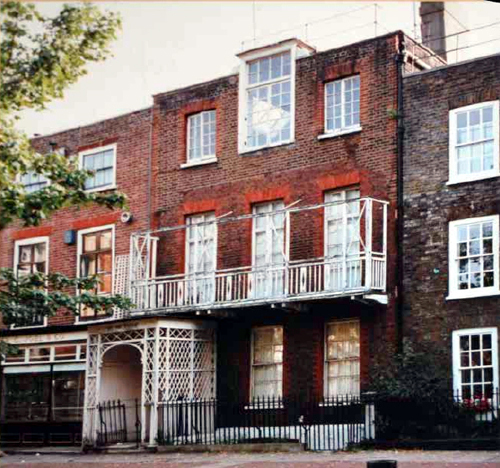 The windows on the first floor were, at the turn of the twentieth century, French windows leading to an iron balcony. These have since been shortened, and filled with brown brick. Additionally, an iron cage with lattice work was present, forming an external porch. In the centre of the second floor was a large studio window. This has been removed, and a square pedimented parapet added above a new cornice. A search of Post Office and Kelly’s Directories from 1860 onwards indicate that it may have been occupied by a boys’ school in 1860. The veranda which was added to the front in the first half of the nineteenth century, along with the trelliswork porch may have led to the house being called Veranda / Verandah House. Indeed, between 1865 and 1872, Mr Arthur Bunce is recorded as living in a house of that name. It is clear that major work took place soon after as there are elevations and plans of the house in 1987, with accompanying proposals for restoration. These show that the building had a studio flat, a large window on the top floor, no parapet, unlike today, and a balcony and trellis porch in poor condition. I was asked to undertake an analysis of the interior as the client wished to carry out a few minor alterations and needed to know more about the various rooms concerned. Many elements were found to be original, dating from the 1720s, and these were seen to have been painted on about twenty occasions. Throughout the last three hundred years the majority of the paints had been applied in variants of stone colour in paints based on lead white ground in oil. Some of the early schemes had a thin layer of oil glaze applied to provide a higher degree of sheen.2 In some rooms darker colours can be seen towards the end of the nineteenth century. There is evidence that major work was carried out in the house throughout the second half of the nineteenth century. During this period the base of the staircase was altered and a number of chimneypieces were replaced. Further work was undertaken during the ca.1910-1920s and there was much evidence of the refurbishment of 1987. 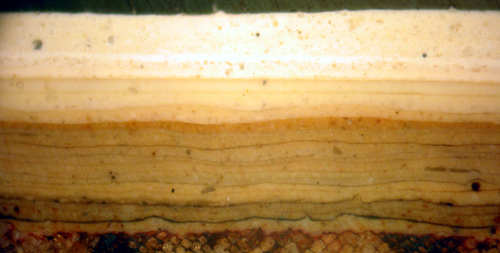 A distinctive pale stone-coloured paint was applied in all areas at that earlier period and this has helped with the dating of various elements. One of the more interesting findings was in a room that was thought to display original panelling and an ornate decorative plaster ceiling of the ca.1730s. An analysis of the paint was to demonstrate that the panelling dated from about 1900 and the ceiling was found to be papier mâché rather than plaster and it displayed only three decorative schemes of modern paint. It would seem that the ceiling decoration may well have been applied as part of the 1987 work. Obviously, the fact that certain elements can be shown to date from the twentieth rather than the eighteenth century puts a different perspective on things and it may be that the authorities will consider any planning applications in those areas more kindly. 1 It appears that Mary Costeker’s will from 1789 survives. 2 For an example of what this might have looked like see The Benjamin Franklin House. I am most grateful for information supplied in a report produced by AOC Archaeology Group.